You can make your skin protection and skin cancer awareness a total no-brainer. This stylish bracelet from SpaFinder changes color in the sun — when it is hit by harmful UV rays. When you see your bracelet turning purple, it’s a visual reminder to take care of your skin and slather on some SPF if you haven’t already done so! I mean, if it’s changing the color of a plastic bracelet, just imagine what it’s doing to your skin! Read on to learn about the bracelet and get some important sun protection facts. Melanoma is the most dangerous –and fatal — form of skin cancer. About 120,000 cases of melanoma are diagnosed per year in the United States alone. Even though excessive tanning and UV ray tanning beds are to blame for a lot of skin cancer cases, just your average days in the sun can accumulate tons of skin damage that can eventually lead to more serious problems. 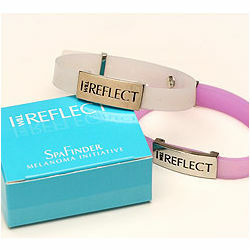 This “I Will Reflect” bracelet puts the emphasis on the rapid effects of UV rays. The clear band turns pink and then purple when it absorbs the rays. You can make your skin health awareness a fashion statement and talking point with your friends — an easy way to spread the word! Upscale beauty brands like Soleil Organique are making sun protection easier and heaps more glamorous than it has been in the past. You don’t have to cover yourself in goopy lotions or unsightly zinc to be safe from the sun’s rays, nor do you have to just admit defeat and deal with your pale, flaky skin. Soleil Organique is also supporting the sale of this Reflect bracelet. Proceeds from the sale of the bracelet go toward the Skin Cancer Foundation’s melanoma research and education programs. You can pick up your bracelet for $4.95 right here. Early detection is key to beating skin cancer. For more information on melanoma and its treatment and prevention, you can go to skincancer.org.